I went back tonight and recounted (yes, seriously) all of the sites in the SAM Site Overview file. Some of the numbers in the folders for the various inventories were a little off, but they are all now 100% accurate insofar as the number of placemarks are concerned. I reuploaded the new file (nothing new added yet as far as content is concerned), so if you download it you should notice the changes in some places. I also edited the SAM Site Overview post, the total figure is now well over 4,000 as I also account for low-resolution sites in that number. I figured why not, I already included the historical sites in the total, and this would push it over 4,000! Basically, I wanted to clean up the SAM Site Overview file before I went through adding all of the SHORAD data, that'll be done and uploaded within the next week. I'll also be editing a few more inventory figures for accuracy; the Baltic states, for example, show active S-200 (SA-5 GAMMON) batteries, when we know they are not used anymore. They show as active because they aren't yet visible in high-resolution coverage, and that's the way I was handling S-200 batteries when I started this a while back, but there's no sense to leaving them wrong. So, that'll be repaired by the time the next update is posted. I'm also contemplating shifting a lot more data into the Historical Sites folder, but that may or may not happen to any significant degree. Basically I'm trying to decide what nation's out-of-service types should potentially have their sites relocated inside the file. The problem is that a lot of FSU states re-use SAM sites for newer systems, so they might actually become active in the future. I'll figure it out. If anybody has any comments, or wants to throw an idea out there to make the SAM Site Overview file easier or more interesting, drop on by the forum and let me know here. On the 25th of May, 2009, the Democratic People's Republic of Korea (DPRK) conducted its second nuclear weapons test. Once again, the DPRK has become an area of focus for intelligence analysts and politicians as the next course of action for the West is determined. While it remains to be seen whether or not tensions between the DPRK, its southern neighbor, and the rest of the world will be mitigated, one fact remains: the DPRK is developing a nuclear arsenal. The DPRK has detonated two nuclear devices in the past three years. The first test took place in October of 2006, with the second taking place in May of 2009. 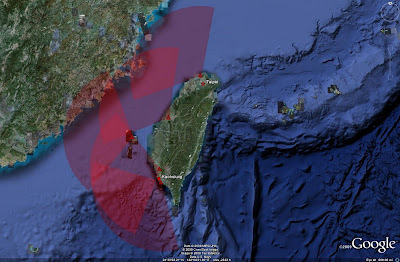 Seismic monitoring has provided analysts with a general location of both test events, along with a rough determination of the yield of both tests. The first test seems to have been a sub-kiloton event, with the second test falling in the 1-3 kiloton range. 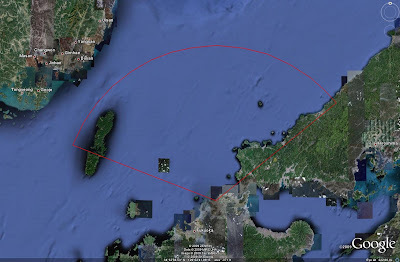 The test location is roughly 65 kilometers northwest of the Musudan-Ri missile test complex, in the isolated northeastern sector of the DPRK. 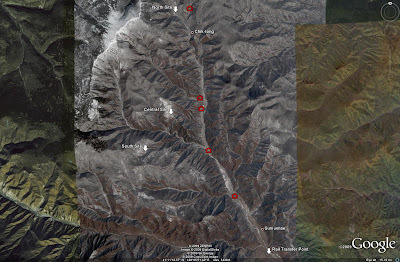 The DPRK's nuclear test site consists of multiple areas. The isolated location is ideal for this type of testing; there is no civillian presence to speak of, and the terrain allows for UGFs to be employed at will to protect and mask sensitive activity. The bulk of the test area consists of three likely test locations, five unidentified locations, and a rail transfer point located south of Sumunnae, representing the only significant source of transportation into the area. 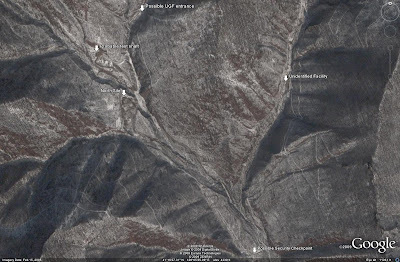 The locations of the identified facilities and areas in the DPRK's nuclear test area can be seen in the image below. Unidentified facilities are marked as red buildings. Two of the possible test locations are similar, with the third site being of a wholly different configuration. 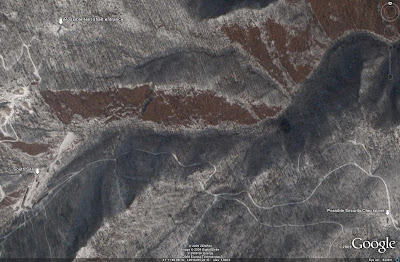 Of the two similar sites, the northern site is commonly associated with the DPRK's nuclear testing. Whether this is due to intelligence sources leaking information or due to imagery interpretation, it is interesting to note that the southern site has escaped mention, as has the central site. Moreover, Globalsecurity offers before and after imagery of the northern site captured at the time of the 2006 nuclear test. While the imagery is not the highest quality, it should be pointed out that there does not appear to be any significant difference or change in activity at the northern site in either image. This begs the question: was this the actual site of the October 2006 test? 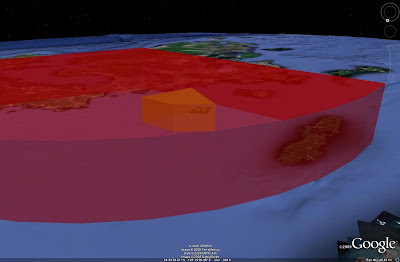 After the 2009 test event, the CTBTO provided coordinate data for the presumed test events of 2006 and 2009, along with probability ellipses indicating the area around the theorized detonation sites where the event was likely located. All three of the identified facilities in the test area fall within the boundaries of both the 2006 and 2009 probability ellipses. While there is no firm evidence to suggest which site was the "host" to which event, some conclusions may be drawn. It is likely that at least one event took place at the northern site, given that all of the coordinates released by various agencies such as the USGS and the CTBTO for the epicenters of the 2006 and 2009 events are arrayed roughly in an east-west line just north of the northern site. This suggests that at least one, and perhaps both, of the test events took place at the northern site. The central site is not as expansive as the other facilities, and features an antenna farm of some sort, suggesting that it may represent a monitoring station for the two other facilities. The devices seen mounted atop the masts to the north of the facility may be atmospheric sampling devices meant to track the unintended release of radiation from the underground tests. Details of the northern, central, and southern sites can be seen in the images below. The first image depicts the north site. A possible security checkpoint for entry into the test area can be seen, as well as the likely location of the test shaft itself. Next, the central site can be seen. This site contains fewer structures than the north or south sites. In fact, the facilities on the western edge of the main area appear to possibly be in disrepair, suggesting that this may have been an existing facility partially converted to use for monitoring the nuclear testing grounds. To the north, the possible sensor masts can clearly be seen. Finally, the southern site is depicted. 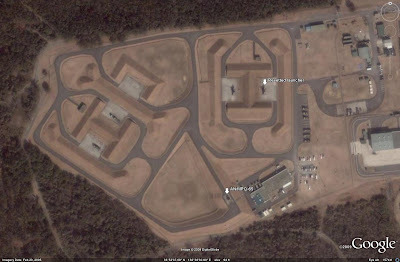 Notice the similar layout to the northern site, with the buildings in the main area of the facility organized in a general "U" shape. There is also a possible security checkpoint, and a facility which may be housing the opening to the vertical test shaft. More likely, however, would be positioning the entrance to a vertical or horizontal shaft inside the main facility itself, given that it is situated in a valley between two ridges. The remaining four unidentified facilities in the area likely perform administrative and support functions for the test range. One such facility, seen in the image below, contains a helipad and apparent housing structures. 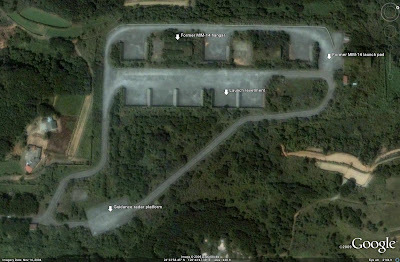 The three remaining facilities may be abandoned or unoccupied military garrisons (the site was imaged in February of 2005), or further housing and support areas for nuclear technicians manning the site during a test cycle. The lack of activity at these locations in the available imagery suggests that the site may only be manned during a test period, and also raises a significant question: where did the bomb come from? 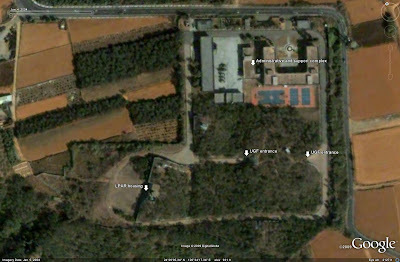 There are numerous UGFs in the area, a helipad, and a rail transfer point to the south. This suggests that range security and transport may be supported by helicopter, and that significant amounts of material and personnel arrive by rail, perhaps after arriving in the region by air. The UGFs and various unidentified facilities are the dark horses of the facility. It is possible that the components were delivered individually and then assembled on-site for a test. It is also possible that there is a nuclear weapons plant buried within one of the UGFs producing the weapons after nuclear material is delivered. A final option, one which has no real supporting evidence but which should nevertheless be considered, is that there is a facility in the region, likely inside of an UGF, that produces both the fissile material and the weapons. Enrichment facilities at Yongbyon would seem to refute this idea, but it does make for an interesting theory: while the world is distracted by the goings-on at Yongbyon, the DPRK quietly produces and tests nuclear weapons at a much more remote and lesser-known facility. Many analysts have assumed that the DPRK is working towards a nuclear capability and has not as of yet fielded a weaponized bomb. There are two holes in this logic which should be pointed out immediately. Bear in mind that this is speculation, and should not necessarily be taken as pure fact, but rather a logical line of thought given the information at hand. Firstly, a small detonation is a small detonation, not necessarily a fizzle or test failure. Current estimates indicate that the 2009 event was the result of a device no larger than three kilotons detonating underground. Rather than assuming that this is a step towards a multi-kiloton, or even megaton class nuclear or thermonuclear device, the possibility that the test was a complete success and the weapon performed as designed should not be overlooked. For that matter, the previous test in 2006 may have been a complete success as well, either testing a small-scale nuclear device or validating the performance of the components to be used for a later test. With regard to the possibility of a small-scale nuclear weapon having been developed successfully, it is known that an armed conflict on the peninsula would result in the DPRK employing a large number of special operations forces. Small devices would be ideal weapons to smuggle into the Repiblic of Korea and detonate in advantageous locations. A small device detonating on the Han river in Seoul, for example, would not only destroy many of the bridges crossing the river, but would likely incite a mass panic, without obliterating a sizeable portion of the city itself. The resulting exodus of civillians, seeking shelter from future attacks or medical care for exposure to radiation, has the potential to interfere with the movement and resupply of military forces in the region. 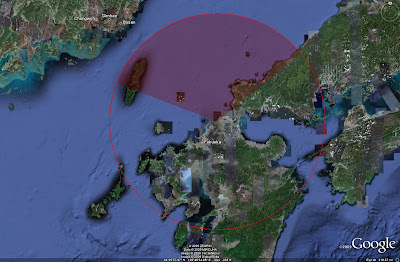 Small warheads would also be ideal for delivery by submarine or missile to targets such as air bases close to the coastline, and could be detonated inside the major port facilities to further complicate the ROK's resupply and civillian evacuation operations. From an asymmetric aspect, they could also be used after an outbreak of hostilities to environmentally cripple fishing grounds in the area which are important for both the ROK and Japan. The second of the aforementioned holes in logic is that current analysis seems to be focusing on a nuclear-armed ballistic missile representing the end result of the DPRK's nuclear weapons program. As demonstrated previously, this may not necessarily be the case. The standard explanation given is that the DPRK has designs on fielding a nuclear-armed ICBM capable of striking the United States. Testing a weapon and miniaturizing the warhead to fit atop an ICBM takes time. However, this assumes that the second test was another trial, and does not allow for the possibility that the device which detonated was a weapons-ready device. If that were to be the case, then it would be likely that the intended delivery vehicle is not in fact an ICBM. If DPRK nuclear warheads do not progress much further in yield, they will not have much value atop the nations's largely inaccurate ballistic missiles over intercontinental ranges. This would make aerial delivery or delivery by other means far more likely as they can impart a greater degree of accuracy. Where the weapons would be valuable in terms of missile delivery would be as "terror weapons" meant to be fired at the ROK or Japan. In this capacity the accuracy of the delivery systems would be less important given the large metropolitan and industrial areas in each nation which would be far easier to target. Also, firing a small yield weapon into the ROK to cause panic among the populace as described previously would not result in a release of radiation on the scale found in detonating a much larger weapon. That would almost make it more logical for the DPRK to pursue smaller yield weapons as they could then be employed in select areas without causing a significant degree of ill effects for the DPRK's own military forces to contend with. Alternatively these small weapons could be deployed in artillery shells or battlefield rockets to pulverize US and ROK positions along the DMZ before an advance into the ROK. However, a limited number of nuclear warheads, large or small yield, are still not logically destined to be fitted to ballistic missiles targeting facilities in or outside the Korean theater. The DPRK's leaders may be paranoid and misguided, but they are not stupid. The United States is fielding numerous ballistic-missile defense systems and has multiple PAC-3 batteries in theater. Japan is also fielding the PAC-3, and the ROK is beginning to field the Patriot system as well, albeit in the PAC-2 form. AEGIS ABM-tasked vessels could also be placed in-theater if needed. This would make relying on ballistic missiles as the delivery system for nuclear warheads a questionable proposition as there is no guarantee that the nuclear-armed missiles would reach their targets. That is not an acceptable proposition for such an important national asset, of which there would only be a limited quantity. In that respect, the asymmetric, naval, or airborne delivery methods begin to seem far more plausible, and more logical from the standpoint of the DPRK. Airborne delivery would not necessarily require any miniaturization of a weapon, making it seem like a decent enough solution, but many of the same air defenses which would be used to intercept ballistic missiles would also be able to target hostile aircraft in conjunction with allied fighters, making airborne delivery a dubious proposition as well. At the end of the day, unless a large number of warheads are fielded to mount atop ballistic missiles and the loss of a percentage is accepted, the most likely uses would seem to be naval or asymmetric. There is still value to testing a nuclear-capable ballistic missile, even if a large scale deployment is not planned. This would force the US, the ROK, and Japan to divert more attention and resources to missile defense, potentially at the expense of other forces in-theater. Ergo, small-yield weapons testing and ballistic missile trials may not indicate that the DPRK is intending to operationally mate missiles and warheads to a significant degree. The next question that must be answered is the future direction of the DPRK's nuclear weapons program. It will be important to study the results of any future nuclear test events to answer some of these questions. Further tests resulting in a yield in the same range seen in the 2009 test will indicate that this is likely the design yield of the weapon. Contrarily, testing of weapons with increasing yield will indicate that the DPRK has its sights set on large yield weapons, and perhaps on thermonuclear weapons. Future nuclear test events will also aid analysts in determining the potential uses for such a weapon. Large yield weapons would have the ability to strike hardened facilities using less-accurate delivery systems, but small yield weapons would have to be accurately delivered and may only have limited use until a time when the DPRK has fielded a ballistic missile with hard-target kill levels of accuracy. Also, an expanded test program with shorter intervals between events will likely indicate that the DPRK has neared deployment of an operational weapon. However, a lack of test events does not necessarily indicate that weapons are not being deployed; if, as theorized previously, the current test met the DPRK's goals, then future testing may not be required until such a time when a larger yield weapon is desired. Missile testing and training operations will also provide insight into whether nuclear warheads are being developed or deployed. Chemical or biological weapons are more likely to be used given their comparative cheapness and the belief that the DPRK maintains a large stockpile of one or both of those weapons. As long as CBW handling operations are detected in missile units without a significant change in procedure, it can be assessed with a degree of accuracy that nuclear weapons are not present. A final option to consider for the future is another weapon system that has been rendered partially ineffective by recent defensive systems testing by the West: a FOBS. 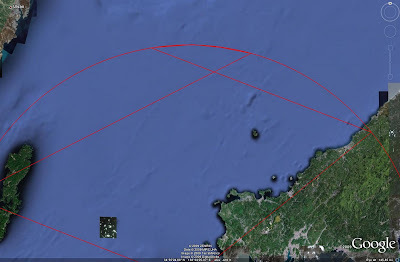 The DPRK's continued efforts to develop the Taepo-dong 2 SLV/ICBM is potentially indicative of a desire to have a space launch capability. 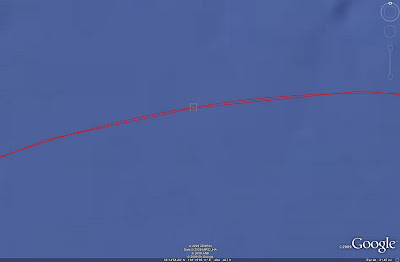 After the most recent test the DPRK declared that a satellite had been orbited, a point which Western analysts dispute. Nevertheless, as a nuclear-tipped TD-2 is a paper threat until the DPRK produces a warhead of significant size to overcome the inherent inaccuracy of the delivery vehicle and develops penetration aids to defeat any American ABM systems, if a satellite launch capability can be developed and demonstrated, a FOBS would be an interesting avenue to pursue. It can be stated with certainty that the DPRK is developing a nuclear weapons capability. How far along the program is, how many weapons may be available, and the intended and actual yields of the developed systems are up for debate. But at the end of the day, it would seem that the world is going to have to make room for another member of the Nuclear Club. How the West approaches and deals with the DPRK will have a significant impact on other nations wishing to acquire the same capability, providing them with an idea of how far the West will go to get its way. In this light, the DPRK's nuclear program, should it reach operational status, may be an impetus for Iran to fully develop a similar capability. And as a final note, the effect of a nuclear DPRK in the Korean theater may have much more ominous implications; could this be the final straw which forces Japan to shake off its self-imposed shackles and become a nuclear and offensive power in its own right? 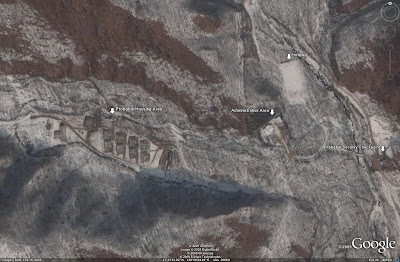 Right now I'm finishing up a piece on North Korea's nuclear testing ground. That one will be up today or tomorrow. In other site news, I've added a few more links to the Recommended Websites and Recommended Blogs sections on the right. Eric Palmer's ELP Defens(c)e Blog has replaced his old two blogs, and I've added Andreas Perbo's Verification, Implementation and Compliance blog. I'm not sure how I managed to forget about adding that one, sorry Andreas! I also added a link to the new Intelligence Magazine website. I'll be starting to author some content for that site in the near future, articles will be mentioned here with a link to their page at Intelligence Magazine. That's about it for now, time to finish up the Nork Nuke piece (Norke?). And yeah, before anyone asks, updates to old articles are still being worked on, and SHORAD systems are still being categorized for the SAM Site Overview file. A lot of that stuff might have gotten finished this week, but then the Norks went all nuclear on us on Monday. Western intelligence organizations began applying codenames to Soviet military equipment shortly after the Second World War. Codenames were a convenient way to describe military equipment when the native designators were often unknown. Eventually, two naming systems became the standard for Western military use. The US DoD assigned a series of alphanumeric designators to missile systems, and the five-nation Air Standards Coordinating Committee (ASCC, ASIC as of 2005) assigned a codename to various military systems and weapons. Other identifiers have been employed, but those listed above are the most common. Using the information above, a lot of information can be inferred by examining an identifier. It can be inferred, for example, that the SA-20 is likely a newer system than the SA-10. Two additional letters can be used before the numerical identifier to describe a system. These are N, denoting a naval system, and X, denoting an experimental system. In the case of the former, these are assigned separate categories. SA-N- and SS-N- prefixes denote naval SAMs and SSMs, respectively. These series are separate from the SA- and SS- series. In other words, the SA-N-4 does not represent a naval variant of the SA-4. In fact, until recently naval SAMs were assigned different numerical designators than land-based counterparts. The naval SA-10 was the SA-N-6. This is because designators are believed ot be assigned chronologically. The first naval SAM system, therefore, was the SA-N-1, even though it was a navalized SA-3. The X designator can be used with naval systems, and in this case it is employed as follows: SA-NX-20. This denotes an experimental naval SAM system, being the 20th naval SAM system identified. Missiles which are for test purposes are not assigned designators. Only weapon systems believed to be undergoing trials for service are given designators, and they typically possess the X prefix denoting their experimental status. When the weapon enters service, the X is no longer used with that system. Suffixes applied after the numeric designator are used to denote different variants of that system. For example, there are six in-service variants of the AA-10, and these are referred to as AA-10A through AA-10F. It is important to note that in the case of missiles, the codename refers to the missile itself, not the entire system. This becomes important when combining DoD and ASCC/ASIC designators to describe a system. When dealing with aircraft, single syllable words denote propeller driven aircraft, while jet powered aircraft have two syllable codenames. For example, the Tu-95 has the codename BEAR, while the Tu-160 has the codename BLACKJACK. Suffixes do not appear to follow a specific rule, but rather a set of loose rules. Firstly, the letters I and O are not used, to avoid confusion with the numbers 1 and 0. Modified variants can be denoted using the suffix Mod., followed by a numeral indicating which modification is being identified. This is commonly used for SAMs and SSMs. For example, GRUMBLE mod 1 refers to the 5V55R missile, while GRUMBLE mod 0 is the earlier 5V55K. Aircraft typically employ an alphabetical suffix to denote which variant of the airfract is being referred to. The Su-27 series is an excellent example. FLANKER-A refers to the original T-10 prototype series, while FLANKER-B refers to the T-10S series production model. Further examples include FLANKER-G for the Su-30MKK series, or FLANKER-H for the Su-30MKI series. Different variations of a subvariant are denoted by adding Variant to the codename, followed by a sequential numerical designator to note the variation. The FLANKER provides another example here, in the form of the Su-27M and Su-37. The former was designated FLANKER-E Variant 1, while the latter was designated FLANKER-E Variant 2. The ASCC/ASIC system is different from the DoD system insofar as it often assigns codenames to anything identified regardless of whether or not it is predicted to be used operationally. For example, both the MiG-AT and Yak-130 received codenames, even though it was widely assumed that only one would be purchased for the Russian Air Force. The ASCC/ASIC system also assignes two-word codenames to radar systems (airborne, ground-based, and naval), such as TOMB STONE, although these do not appear to follow any sort of naming convention. In some cases, such as SPOON REST or CLAM SHELL, the codenames are an amusing play on the visual appearance of the radar array. As mentioned previously, US DoD and ASCC/ASIC designators can be combined to describe a given system. Consider the example of the S-300P series. Being a SAM system, it has a DoD designator prefixed with SA and an ASCC/ASIC codename starting with G: SA-10 GRUMBLE. Employing the proper suffixes can provide a detailed description of the system. A SAM battery described as employing SA-10B GRUMBLE Mod 0 systems can therefore be known to possess mobile components (SA-10B refers to the S-300PS or S-300PMU) equipped with the 5V55K missile. Ergo, the system is not operating to the limit of its capability, as the 5V55K is shorter-ranged and uses a simpler guidance method than the 5V55R or 5V55RD. There are numerous errors in the way that these designators are referred and employed by analysts, journalists, and authors. First and foremost, ASCC and DoD codemanes are often used by NATO forces, and have erroneously been referred to as "NATO names". This is not the case; NATO did not devise these designators, the US DoD and/or the ASCC/ASIC did. Secondly, codenames are often not properly formatted. Codenames should be written in all capitals. Returning to the Su-27, the commonly seen printed name is Flanker rather than the correct FLANKER. Thirdly, correct codenames are often misused. Many sources refer to the 64N6 as TOMB STONE, when this is in fact BIG BIRD, for example. Other sources confuse the same issue altogether, referring to the guidance radar as "64N6 Tomb Stone". Correct codename, wrong radar system, and improperly formatted. This is not intended as an all-inclusive lesson on Western codenames, but rather an introduction to how they are devised and employed. Understanding the systems in place aids an analyst who is not fully versed on Soviet/Russian system names (many Chinese or Warsaw Pact systems such as the JH-7 and L-29 have also been named using these systems as well), and also will aid in properly employing them. For a comprehensive listing of known codenames and further explanation of other DoD and ASCC/ASIC sequences, Andreas Parsch has done a very good job here. Over the next few days I'm going to be updating some of the older articles. Older features such as the Syrian SAM Network piece are out of date given new data that has been acquired, and need to be altered accordingly. As mentioned a while ago, when an article is updated it'll jump to the top of the list as it'll be "re-posted" on the date it is fixed up. In the "Latest Updates" menu on the right, an article which has been changed will be relisted. Instead of saying "published", it'll say "updated", to denote that this is a change to a previous piece. Note that when an article is updated and reposted, the link to the article does not change. So, if you have linked to any of these pieces on another site, you won't have to change anything. You'll automatically be linked to the updated version. The normal method used to illustrate SAM engagement ranges graphically is to display a ring around the site corresponding to the engagement range of the system. As the theory goes, any aircraft inside of that ring could potentially be engaged by the system. With certain types of strategic SAM systems, however, this method is not entirely accurate. Engagement radars are often sited and aligned along a certain bearing. If the radar is not capable of continuous 360 degree rotation, the radar's field of view in azimuth dictates the engagement zone of that deployed SAM battery at a given time. Consider the following examples. Taiwan's Tien Kung SAM systems are deployed from fixed, silo-launched positions, supported by fixed, hardened Chang Bei LPARs. Given that these radars are occupying fixed positions, the engagement zone of the SAM system is dictated by the 120 degree FOV of the radar, 60 degrees to the left and right of center. The Russian S-300P series of SAM systems and the American Patriot missile system operate in a similar manner. These two mobile SAM systems operate by deploying their engagement radars in a given position. The Patriot's AN/MPQ-65 radar has the same 120 degree FOV as the aforementioned Chang Bei, providing it with a similar engagement zone. The difference between the AN/MPQ-65 and the engagement radars employed by the S-300P series is that the Patriot's radar also performs acquisition functions. The S-300P's radars are cued by 36D6 or 64N6 series radars. Mounted on towers or on mobile vehicles or trailers the S-300P's radars can easily be rotated to face an inbound threat. Ergo, the S-300P series SAM systems are not as "tied in" to a particular zone as the Patriot is. While the S-300P's engagement radars offer azimuth sector coverage of between 90 and 105 degrees depending on the variant, and operationally they will typically be tied to a certain sector for deconfliction purposes, the system is credited with full 360 degree capability due to mounting the engagement radars on rotating platforms. The AN/MPQ-65, on the other hand, is emplaced statically to facilitate target acquisition, and is therefore not a "true" 360 degree coverage system, despite its mobility. How, then, to better illustrate these concepts graphically? The answer is to use a wedge shape denoting the field of view of the engagement radar array in systems for which a circular range ring would not be appropriate. 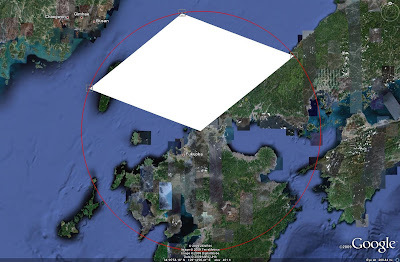 Google Earth serves as a good platform for developing and displaying these shapes. The process for doing so will be described below. Readers are advised to read the instructions completely before trying this for themselves. First, a suitable weapon system must be located. 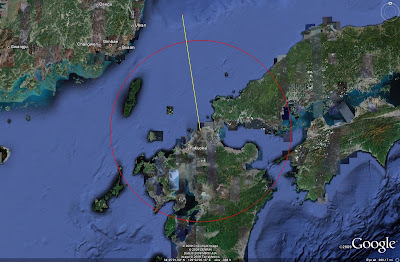 For this example a Patriot battery near Fukuoka in Japan will be used, seen in the image below. For this to be accurate, the AN/MPQ-65 position must be identified positively. The first step in calculating an approximate engagement zone for the system is to determine the azimuth which the radar is oriented towards. Start by placing a line parallel to the edge of the radar array, as seen below. 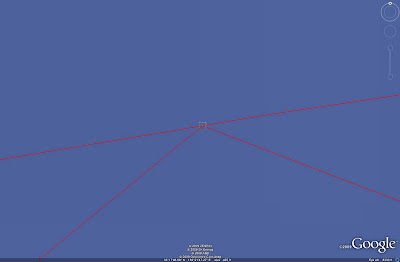 Using the Ruler tool in Google Earth is best, as it will give you the azimuth of your line. 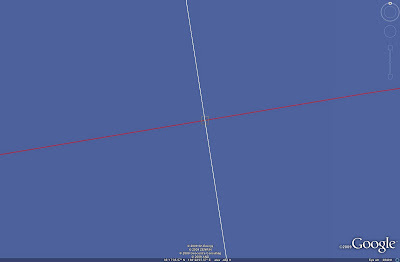 A heading parallel to the face of the radar array would seem to be approximately 81 degrees, travelling from right to left. In order to generate the wedge, three placemarks are needed. The first should be placed at the point where the Ruler tool's line crosses the range ring. Zoom in on this point to ensure accuracy, and deposit a placemark as seen in the image below. I have set the placemarks to have zero opacity for their labels, meaning that no text will be displayed. The following process should now be repeated to set placemarks along the boundary of the radar's FOV. 60 degrees left and right or 351 degrees equates to headings of 291 degrees and 51 degrees. Repeat the above processes, dragging lines from the radar out past the range ring on these headings and inserting placemarks where they cross. The goal is to correct the Area's primary points so that they match up with the placemarks on the range ring. Right click on the Area placemark again, select Properties, and drag the points until they are in the correct locations. Zooming out and displaying the range ring, as seen below, we can see that using a wedge instead of a ring is far more accurate. Under the pull down menu, select Absolute. This must be done first. Under Altitude, enter 30,000 meters, which is roughly equivalent to something close to the Patriot's reach. Click on the box that says Extend sides to ground. Notice the new engagement zone (yes, you need to use a different color for a different system) inside the Patriot zone. One final point to consider. Remember, the Patriot is typically tied to a specific engagement zone, but the radar can still be moved. This is a far more complicated procedure than simply slewing the S-300P's engagement radar to a new bearing and recoordinating with the battlefield management station, but it can be accomplished nonetheless. The main point here is that the basic range ring does show the capability of the system, but the wedge shows the capability of the system at a given point in time. By combining these two methods and employing a little bit of tweaking here and there, we can get a full, 3D representation of a PAC-3 ERINT battery, as seen below. This highlights the need to have a very in-depth understanding of a given SAM system before attempting any sort of analysis, imagery based or otherwise. 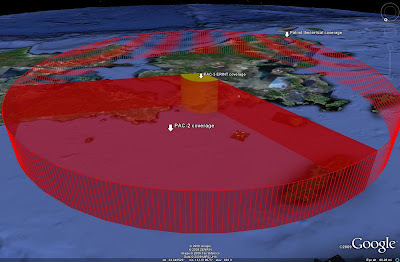 These are the TK-II engagement zones from the Taiwan SAM Network feature displayed in 3D. They are all set to the same altitude of 30,000 meters. Notice how overlap in the wedges can be seen as the boundaries are always visible due to the opacity of the red fill, but along the upper surface there are various patches that do not match with any sort of overlap. Why this occurs, I have no idea. Perhaps this has to do with data inconsistencies in the Earth's surface in that part of the world. At any rate, displaying the wedges in "flat" mode and not 3D gets rid of any such occurrences. You are now authorized to be impressed, and are directed to go forth and employ these techniques to produce your own analysis pieces. Any questions can be directed to the author in the IMINT & Analysis Forum, by blog comment, or by e-mail. Go forth and analyze. 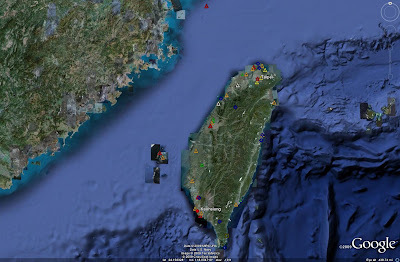 The island of Taiwan sits less than 200 kilometers from the coast of the People's Republic of China. 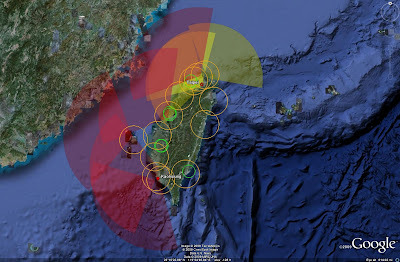 Faced with a potential threat consisting of over a thousand ballistic missiles and swarms of strike fighters, Taiwan's strategic SAM network is a significant element of the island's defense. Strategic air defense of Taiwan began in the 1950's during a highly classified US military deployment to the island. Soldiers and equipment from Fort Bliss deployed to Taiwan as the 2nd Battalion, 71st Artillery, forming a four battery MIM-14 Nike-Hercules SAM network along the northwestern edge of the island. The deployment of US Army personnel only lasted for a year, but the seeds were sown for Taiwan's strategic air defense network. Not only did Taiwan retain the four Nike-Hercules batteries previously operated by the US Army, but a further four batteries had been procured at some point before the mid 1970s. These systems represented the first significant strategic air defense network to appear in the cross-strait conflict zone, and were retired in 1996. Taiwan's present-day strategic air defenses are oriented logically with respect to the perceived primary threat to the nation's security: the People's Republic of China. 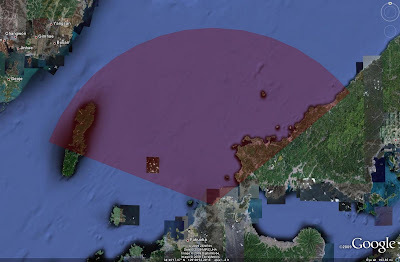 The bulk of the air defense assets are located on the northern and western sides of the island, with their sensors illuminating the cross-strait environment to monitor for any unauthorized inbound traffic. 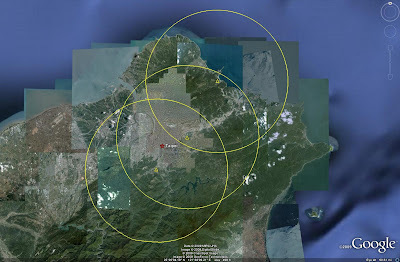 Air surveillance is provided by eleven EW facilities, and engagements are prosecuted by twenty two fixed missile batteries, occupied by HAWK, Patriot, and Tien Kung SAM systems. These systems have engagement ranges of 40 kilometers, 160 kilometers, and 200 kilometers, respectively. 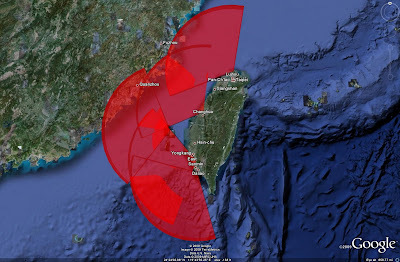 A further twenty two Skyguard facilities are located to provide close-in defense of key population centers and military facilities, some of which are equipped with 18 kilometer range RIM-7M Sparrow missiles. Taiwan acquired the MIM-23 HAWK SAM system in the 1960s. Thirteen prepared HAWK sites are currently occupied by active batteries. One battery is located offshore in the Penghu island group. The remaining sites wrap around the western coast of Taiwan at intervals of roughly 65 kilometers. Taipei and Kaohsiung, Taiwan's largest population centers, are defended by three sites and two sites respectively, with closer spacing to provide a greater degree of overlap in their fields of fire. Three sites are present on the eastern shore of the island, situated to defend the three main population centers in that region. CSIST began to develop the Tien Kung SAM system in the early 1980s, envisioning a replacement for Taiwan's aging HAWK batteries. The system has been produced and deployed in two variants, the Tien Kung I (TK-I) and the improved Tien Kung II (TK-II). An ATBM Tien Kung III is in development. The TK-I was originally fielded in both static and mobile variants, with the TK-II only being deployed in a static variant. In 2006 it was announced that the TK-I was being retired and replaced by the TK-II. It was not specified if the TK-Is were only being replaced in the static launchers, or if the mobile TK-Is would be withdrawn as well. The TK-I was deployed on a trial basis in 1989 and declared fully operational in 1993. The TK-II was deployed in 1996. The TK-I had an engagement range of 100 kilometers, with the TK-II having a range of 200 kilometers and adding an active radar terminal homing seeker. The TK-I, in contrast, relied on SARH for terminal homing. Both systems receive target acquisition and midcourse guidance support from an ADAR-1 Chang Bei LPAR. In the TK-I, a CS/MPG-25 continuous wave illuminator provides the necessary target illumination during terminal homing for the SARH guidance method. The static SAM systems are deployed in silo launchers at six fixed sites, two sites being located offshore. One is located in the Penghu island group, and the other is located in the Dongyin island group. These silo launch facilities are unique in the field of air defense; no other active land-based SAM system in the world uses a silo-based launch method. Each silo launch complex consists of two separate areas: a silo launch facility and a radar facility. The silo launch facility consists primarily of five underground launch complexes. These complexes each house four four-round vertical launch cells for TK-I or TK-II missiles, for a total of 80 missiles per complex. Two CS/MPG-25 CW illuminators are present at each complex. The image below depicts a silo launch facility constructed on the grounds of a former Nike Hercules launch site. Mobile TK-I systems may be deployed at these fixed launch facilities in some capacity, either to augment the silo-mounted TK-IIs or simply to utilize the garrison facilities before being field deployed as required. It is possible that mobile ADAR-1 LPARs could also be employed at silo launch facilities to increase the target engagement capacity of a single battery. Whatever the case, CS/MPG-25 illuminators were still emplaced at static launch complexes imaged at various points in 2006, implying that TK-Is were possibly still present in some capacity and had at the very least not yet been fully removed from silo launchers. The radar facility consists of a fixed, hardened ADAR-1 LPAR. One radar facility is attached to each silo launch facility. The two facilities are separated by a distance of between one and four kilometers and are treated as a single complex. Separating the complexes allows for the hardened radars to be built into bunkers which are at a higher elevation than the launch facility. This allows the radars to have a less cluttered field of view without employing far more vulnerable mast-mounted antennas, and to mitigate the effects of the radar horizon on the system's engagement envelope. 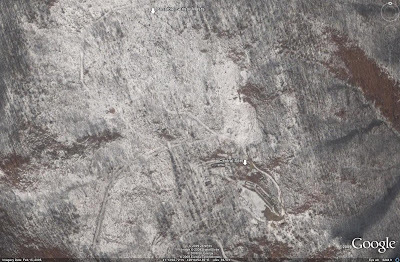 Both of the above images are interesting in that they are both censored in the default Google Earth imagery set. They can only be accessed through the historical imagery feature. Various Tien Kung associated facilities can only be viewed in this fashion. 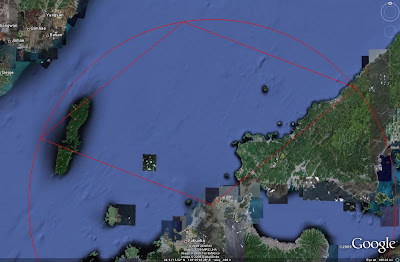 While the Tien Kung SAM system has a maximum range of 200 kilometers with the latest TK-II variant, the engagement zones of these fixed launch sites are oriented in specific directions. The fixed ADAR-1 LPAR has a 120 degree field of view in azimuth, able to scan 60 degrees to the left and right of center. This determines the engagement zone available to a missile fired from the associated fixed launch site. Mobile radars could theoretically be employed to increase the coverage zones, but it is not known if the TK-I's mobile ADAR-1 sets are compatible with the silo-launched TK-II missile. It would seem likely that they are, or could be with minimal modification, given that the hardened ADAR-1 radars are still employed by the TK-II system. The locations and engagement zones of the five southern fixed launch sites can be seen in the image below. The zones are oriented to match the likely fields of view of the hardened ADAR-1 LPARs and correspond to the 200 kilometer TK-II system. A TK-I fired by a fixed launch site would engage a target within the same zone, but only to half the range. The Dongyin island group Tien Kung site is not included as the LPAR field of view cannot be determined due to a lack of high-resolution imagery. In 1993 Taiwan purchased three MIM-104 Patriot SAM batteries from the United States, receiving PAC-2 standard weapons. Taiwan's three Patriot batteries became operational in 1998 and were deployed at prepared sites near Taipei for capital area air defense, focusing on an ATBM role. The AN/MPQ-65 radar, when emplaced, has a field of view of 120 degrees in azimuth. The radar is not rotating for full 360 degree coverage, rather it is aligned in the direction of a potential threat axis when deployed. While the radars can be repositioned and realigned when needed, historical imagery indicates that these three batteries have remained aligned in the same general direction since at least 2000. The main issue facing Taiwan is numerical. 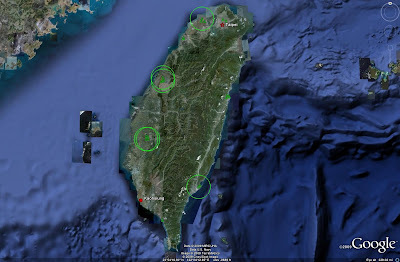 With an estimated 1300-1500 ballistic missiles and hundreds of strike aircraft targeting the island from the People's Republic of China, it would appear that Taiwan simply cannot afford to procure and deploy enough land-based SAM systems to guarantee clear skies in a time of crisis. That is not entirely true, however, given a complete understanding of a potential conflict. The People's Republic of China wishes to reintegrate Taiwan with the mainland, not acquire a new bombed-out target range for its military forces. 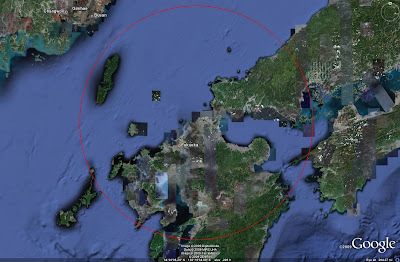 Logically speaking, while certain targets are likely to be struck during a military engagement, and likely struck multiple times to increase the chances of oversaturating the air and missile defenses, it is not likely that the PLA will simply bombard the island into submission. Simply speaking, that would completely defeat the point of any military confrontation designed to reintegrate Taiwan. 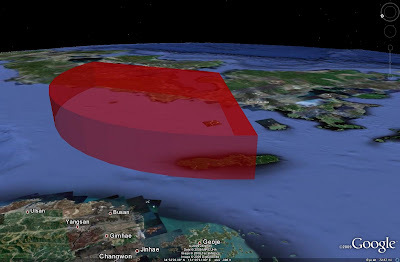 Therefore, when faced with a numerically superior force desiring to eliminate key military facilities rather than to obliterate the entire island, the logical approach would be to employ strategic SAM assets and air interceptors in an integrated air defense system (IADS). In an integrated warfighting environment, TK-II SAMs could be employed beyond a certain range to thin out inbound formations, while air interceptors remain on station to combat the remaining inbound aircraft. Any cruise missiles or aircraft penetrating the combat air patrol zones could be engaged by HAWK SAMs, as well as SHORAD systems such as Skyguard. Naval SAM systems could also be employed offshore to provide further assistance in thinning out any inbound aggressors. While this strategy would likely still result in a number of successful strikes, it represents a logical, organized use of the assets at hand when faced with a numerically superior threat. Taken as a whole, the strategic SAM network on Taiwan is well organized. Engagement zones have a significant degree of overlap, allowing targets to be shared by multiple systems, and HAWK batteries are logically deployed as both a closer-in defensive line and a gap filler to eliminate holes in the network created by the azimuth limitations of the hardened ADAR-1 LPAR facilities. 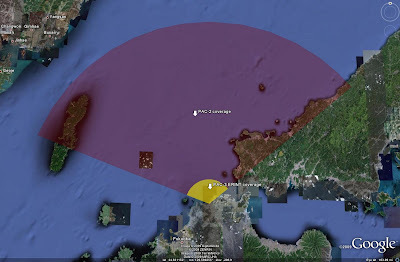 The overall coverage zones of Taiwan's strategic SAM systems can be seen in the image below. As mentioned previously, the Dongyin island group Tien Kung site is not illustrated. It should be pointed out that the eastern side of the island is relatively undefended in terms of SAM coverage. This should not necessarily be seen as a weakness in the overall network, as the bulk of the military and political targets likely to be struck during a conflict are not in this region. 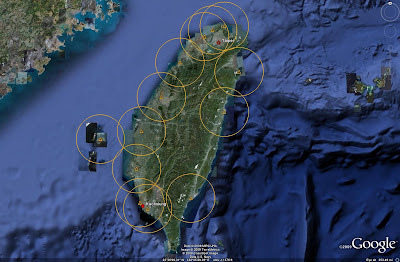 It has been reported that Taiwan possesses eighteen or twenty HAWK batteries, but there have only been thirteen HAWK sites identified. The remaining batteries are likely held in reserve for attrition replacement and training purposes. They are also potentially available to be field deployed during a crisis to reinforce air defenses in certain sectors. Likewise, existing HAWK batteries could be removed from their fixed locations and deployed to field firing positions, as could Patriot or extant mobile TK-I units. There is evidence suggesting that plans may exist for redeploying Patriot and/or TK-I batteries during a crisis. The following image represents a Patriot or TK-I mobile SAM site constructed on the grounds of a former MIM-14 battery. The image was captured in late 2004, when Taiwan only possessed three PAC-2 Patriot batteries. These batteries were all intended primarily for ATBM defense of Taipei, as previously mentioned, and were already sited in that region. 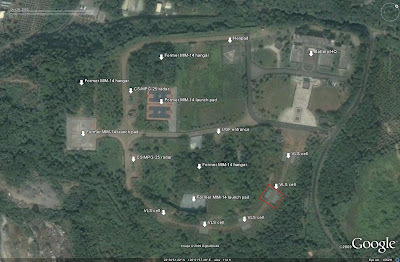 Ergo, this unoccupied facility was likely not intended to house a permanent Patriot battery, as the only Patriot batteries in Taiwan were already positioned according to their intended role. It is, of course, possible that this facility was home to a mobile TK-I battery which has since been deactivated, but that does not preclude the site from being used as a deployment site in the future. One oddity that stands out when analyzing the coverage zones of Taiwan's strategic SAM network is the presence of a corridor north of the Penghu island group, heading roughly north towards the Chinese mainland, which is only defended by a single Tien Kung fixed launch site. This is unusual because care has apparently been taken to ensure a degree of overlap in most of the network. This corridor could simply be an aberration of geography meant to be filled by a naval SAM system, it could be a purposely less-defended corridor for civillian traffic meant to be filled by a mobile TK-I battery in the Penghu islands, or it could represent a "safe zone" for outbound strike aircraft. 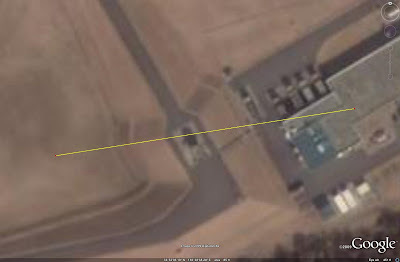 The latter example is noteworthy; as the corridor passes over the Chinese mainland, it is flanked on either side by a Chinese S-300PMU-1 (SA-20A GARGOYLE) SAM battery. 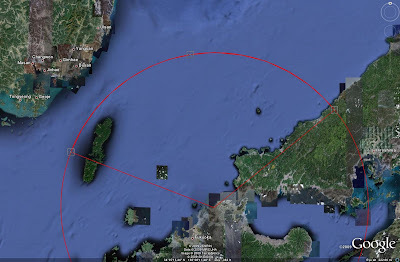 This could have been identified by the People's Republic as a potential ingress route for Taiwanese strike aircraft desiring to enter the Chinese mainland and attack ballistic missile launch positions and garrisons. 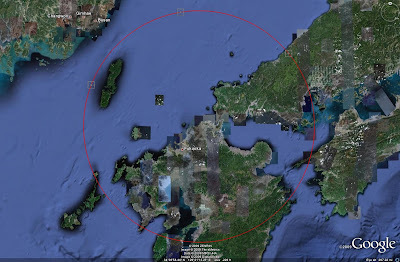 The PLA's DF-11A garrisons at Xianyou and Yong An, along with the DF-15 garrison at Nanping, would likely be within reach of such a strike package. This is, however, pure speculation, but does draw attention to the types of data which could potentially be revealed by analyzing an air defense network. In the future, Taiwan's goal is to greatly increase the effectiveness of its strategic air defense network against ballistic missiles. To that end, CSIST has been developing the TK-III, an ATBM off-shoot of the TK-II. The Taiwanese government has also been in negotiations with the United States to procure PAC-3 series Patriots with their associated ERINT ATBMs. The ERINT ATBM has a range of 20 kilometers against a ballistic target, and is designed as a hit-to-kill weapon with very high accuracy. An enhanced variant is being developed which would increase the ATBM range to 45 kilometers. In January of 2009 it was reported that Taiwan had received approval for a contract with Raytheon to upgrade the three existing PAC-2 batteries to PAC-3 standard, enabling them to support the ERINT missile. Taiwan is still negotiating the sale of 330 ERINT missiles as well as four AN/MPQ-65 radars and other Patriot components to deploy three or four additional Patriot batteries. Taiwan is also developing a new SHORAD system based on the Tien Chien II (TC-2) BVR AAM, to be integrated with the Antelope SHORAD system as a Skyguard replacement. No discussion involving the TK-II SAM system would be complete without a brief mention of the Tien Chi surface-to-surface missile derivative. This weapon is a 320 kilometer range system fired from static TK-II launch sites. It is believed that the system is deployed in two locations, and that one of them is the Tien Kung facility in the Dongyin islands. The other is likely the Tien Kung facility in the Penghu islands, as offshore basing does allow for greater inland reach of mainland China. 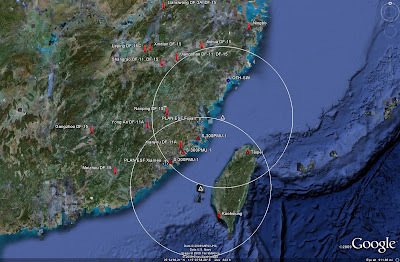 The following image depicts some of the potential targets for the Tien Chi missiles, assuming that they are based at the two aforementioned locations. The missile locations and their associated ranges are indicated in white. 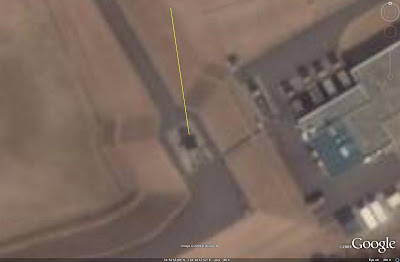 Do note that not only is one of China's OTH-SW systems within range of the Dongyin site, but that it can also reach the two S-300PMU-1 batteries mentioned previously. 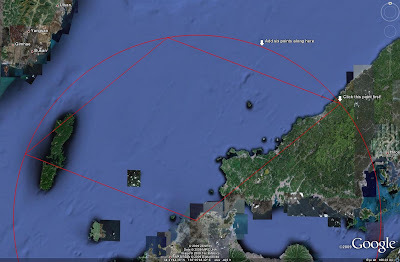 The main drawback of the system, however, is short range; the image depicts the PLA's 52nd Division ballistic missile units, and only two of them are within range of the Tien Chi system. Given the sheer number of Chinese ballistic missiles available in the theater, it is more likely that the Tien Chi is intended for high-value targets such as the OTH-SW system. 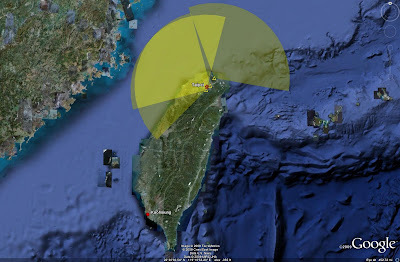 Taiwan's strategic SAM network has been arranged logically given the potential threat it has been designed to counter. As more ATBM systems are developed, the network will continue to evolve into a more modern, capable system, in much the same manner that the network of Taiwan's cross-strait rival has evolved. While the SAM network is not capable of deterring a massed, large scale attack, it is modern and credible enough to act as a potential deterrent against small-scale incursions or attacks, and therefore is a stabilizing force in the region. A Google Earth file containing the placemarks used in the generation of this article can be downloaded here.